Yes, sorry Jen about your brother's friend. I had a brother in law that had a heart attack at age 31. He survived it at that time, just barely! He was adopted so did not know his family history. He did NOT take care of himself. He was a heavy smoker and overweight. It scared him enough to lose some weight and stop smoking, but eventually, his old habits came back. He and my SIL got divorced as he had some affair....eventually married that woman....but at age 50...he had another heart attack and died! He just did NOT take care of himself and everyone was amazed he lived as long as he did. Other folks can take pristine care of themselves and still have heart issues, though that is a lot less likely. The guy that wrote those original books on running back in the 70s (for any of us old enough to remember) had a strong family history of heart attacks. He ate right and started running to avoid his "destiny". I think he was in his 50s or 60s when it caught up to him and he had a fatal heart attack. People said, "See...he had one anyway"...but cardiologists were quick to point out that his family history was SO bad, he probably bought 20 years of quality living from all the right things he did. Nice that you are there for your brother!!!! Best wishes to him and he goes through his loss. We probably got about 4 inches of snow last night on top of the two we had earlier. Another potential for as much as 3 more for tonight. 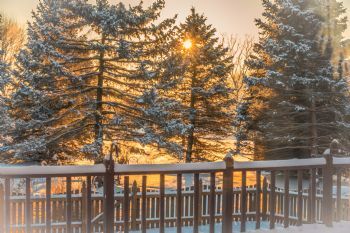 As much as I'm done with winter, the morning sunrise was absolutely AMAZING..... Attaching photo at end (if I remember). Swam 1700 yesterday and used the swim snorkel LESS.... I was using it for 800 yards of the swim and worked it down to 400 yards. I swam 400 yards straight without stopping....This doesn't seem like much given the yardage I used to do, but after 18 months of no swimming (sans the 2X I tried to swim in great pain), I'm having to rebuild. Still not as bad as when I returned after 38 years of no swimming! LOL I could BARELY make the 25 yard lap without gasping for air!!! It's nice to see you here Teniswhiz!!! We do have new folks and I think you'll find they are pretty cool and will enjoy sharing with you and your experiences! But losing anyone at any age is hard. It's especially hard when somone is young though. And early 30s is very young. So my sympathies are with you and your brother at this time. Glad to see other people chatting and getting to the pool! I've had a sinus infection and was down for the count for about a week. The antibiotics have kicked in now and I was able to hit the treadmill yesterday. No sprints, but 30 minutes between 3.7 and 4.3 mph was plenty challenging. Anyways, go Eagles I suppose lol! I'm on the outskirts of Philly, tonight might be crazy out there regardless of how the game goes! Yes, hello again, Tenis! I swam again today; third time this week which is great. I swam competitively as a kid and restarted swimming laps for fitness about ten years ago. I'm still pretty fast and came in third place in my age group in a regional ocean "marathon" (1.2 miles) back in 2011. I try to do at least two open water swim events a year. My times have really started to drop and life events have effected my training. But still swimming and loving it as I approach 59 years of age! Not sure about your shoulder, but I have found swimming is great for random foot and leg injuries! Good for you, Teni, for sticking with it through those injuries. And 1600 yards is terrific! I continue to be thrilled with my 15 minute morning yoga workout. Lots of core work/abs involved. I really stretch my back and legs too. Yesterday I got some small weights; I have decided to add five minutes of weight training as well. Just a matter of getting up 20 minutes earlier! Planning on doing 30 minutes on the elliptical after work. It does keep you on your toes, staying fit, doesn't it? Nice seeing you again, Heather.... I'm trying to get back into the swim of things again....slowly. Coming off a year and a half shoulder injury that completely prevented me from swimming! Had therapy on it and started to go back in the water but then tripped over some tar in the road while running and broke my hand!!!! Another huge setback! So went last Tue and did a slow 1600 of variety of things. Shoulder was tired, but not sore. Hoping to get in again today. I love your dedication Brownme!!! You inspire me!!! I can't believe it's Thursday already. I think I picked up another client, so that's 6. Now, this one is only for a tax return, not bookkeeping, so it's not as lucrative, but I'll take it!! I'm following up today to see when we can meet so I can start her return. Exercise plods along.....January is hard but it's February now, and that means it continues to get brighter and brighter in the evening.....yay!! Planning to cross train on the elliptical and lift weights today. Will hopefully swim again tomorrow! Good swim today. The club is still a little busier than usual, with the new year's resolution folks. By March, it will be back to normal! I'm keeping my promise to work out every day, even if only for 10 minutes. I'm happy about that!! Team Chat Week of 2/25/19! !